TEMPE, ARIZ. (May 30, 2017) – Fidelity National Title Agency is proud to announce that Leo Sanchez, Assistant Vice President, Commercial Sales Executive/Major Accounts, successfully completed the prestigious Arizona State University W.P. Carey School of Business Master of Real Estate Development Program. 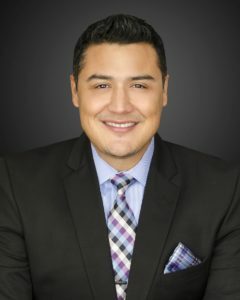 Sanchez, who has been with Fidelity Title for two years, is responsible for maintaining client relationships, account management, and business development for major accounts in the commercial real estate sector across all asset classes. In addition to his recently-earned MRED degree, Sanchez also holds an MBA with a concentration in finance from the Keller Graduate School of Management. A native of El Paso, Texas, Sanchez is active in several industry organizations and serves on committees for ULI Arizona and NAIOP Arizona. He is also a member of Valley Partnership. Sanchez has lived in the Valley 17 years. He and his wife, Maricela, volunteer with various nonprofits, working with organizations that serve underprivileged children. The nine-month MRED program prepares participants to lead real development projects that are environmentally respectful, socially responsible, and artfully designed. It is a transdisciplinary partnership between four highly regarded schools within ASU: The W. P. Carey School of Business; the Sandra Day O’Connor College of Law; the Herberger Institute for Design and the Arts; and the Del E. Webb School of Construction.